There is nothing fast about this track of roadway. Staff members of the agency that oversees the Bay Area's state-owned bridges have recommended raising car tolls by at least a dollar on all seven bridges and imposing a charge for carpoolers for the first time since the 1970s. The Metropolitan Transportation Commission's Bay Area Toll Authority Oversight Committee also is recommending that car tolls be increased by $2 on the Bay Bridge during commute hours and increasing tolls for trucks on all bridges by higher amounts. 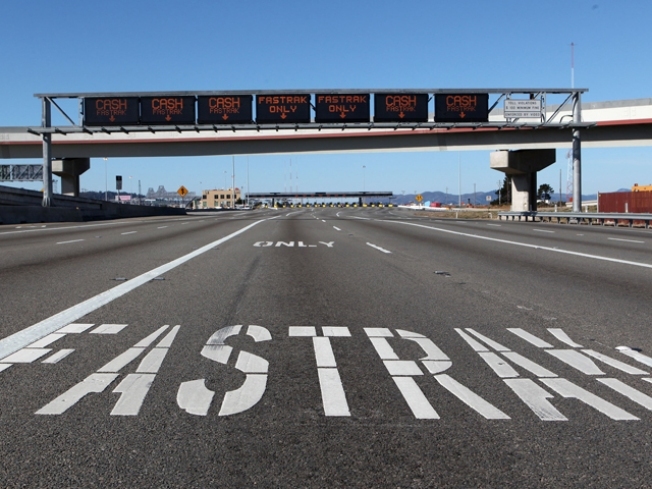 Staff members first proposed a toll hike in October and the idea has been discussed at a series of public hearings throughout the Bay Area. The Oversight Committee is scheduled to vote on a toll hike on Jan. 13 and the full Bay Area Toll Authority is scheduled to vote on Jan. 27. If a toll hike is approved, it would take effect next July 1. The staff proposal presented at the Oversight Committee's meeting today combines elements of three options that were first presented in October. The proposal calls for car tolls on six of the seven state-owned to increase from $4 to $5 at all times. On the Bay Bridge, car tolls also would increase from $4 to $5 most of the time but they would increase an extra dollar, to $6, during peak commute hours, which are from 5 a.m. to 10 a.m. and from 3 p.m. to 7 p.m. on weekdays. In addition, carpools would have to pay $2.50 during commute hours on all seven bridges. Carpools now cross the bridges for free during commute hours. For trucks, the charge per axle would increase to $5. Consequently, three-axle trucks would have to pay $15, four-axle trucks would pay $20 and five-axle trucks would pay $25. MTC spokesman Randy Rentschler said the reason staff members are proposing a higher percentage toll increase for trucks is that trucks "have had a free pass for years" because previous toll increases were smaller for trucks on a percentage basis than they were for cars.